A great buffet side, this is a make-ahead candidate. Prep it the night before, pop it in the oven an hour before you’re ready to serve and let it sit for 15 minutes before putting it out to keep it from being overly sloppy. A great spring dish, it’s also deeply satisfying winter comfort food. Brookside Gardens March 12, 2014. Prep greens: Cook onion in 2 tablespoons butter in a wide heavy pot over moderately low heat, stirring, until softened. Add chard stems, pinch of nutmeg, and salt and pepper to taste and cook, stirring, until vegetables are tender but not browned, about 5 minutes. Increase heat to moderately high and add chard leaves by large handfuls, stirring, until all greens are wilted. Assemble gratin: Preheat oven to 400F. 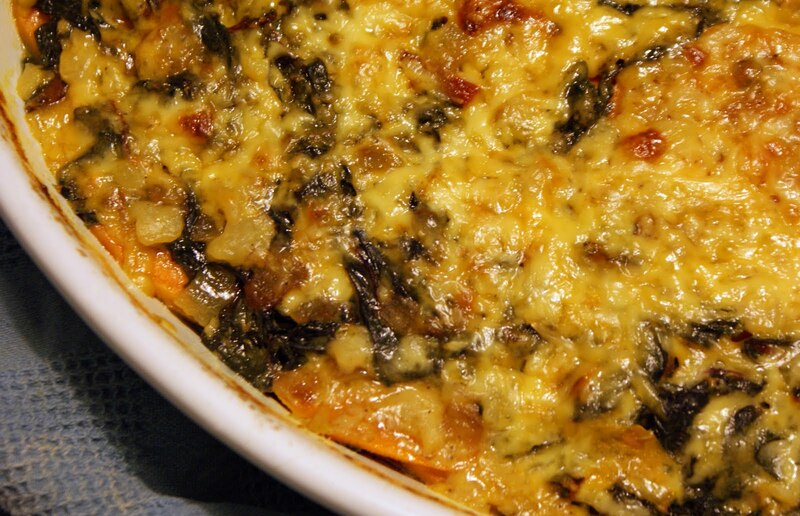 Spread half of sweet potatoes in a 9×9 or oval baking dish. Sprinkle with salt, pepper, a ½ teaspoon of thyme and a 1/4 cup of the cheese. Distribute half of the greens mixture over the cheese and add another 1/4 cup of the cheese over it. Pour half of bechamel sauce over then continue with the remaining sweet potatoes, herbs and cheese and then the remaining greens, salt, pepper and herbs. Pour the remaining sauce over the top of the gratin, pressing the vegetables slightly to ensure that they are as submerged as possible. Sprinkle with the last 1/4 cup of cheese. Bake gratin covered for about 45 minutes, then uncovered for another 15 minutes, to lightly brown the top. Let stand 10 minutes before serving. Serves 4-5. This entry was posted in Gluten Free, Main Courses, Sides, Vegetarian and tagged cheese, Sweet Potato, swiss chard. Bookmark the permalink. being honest and offering good service.